Hey Presto... you've made it, you're on the webpage for Andy's Magic, children's entertainer and magician in Solihull. 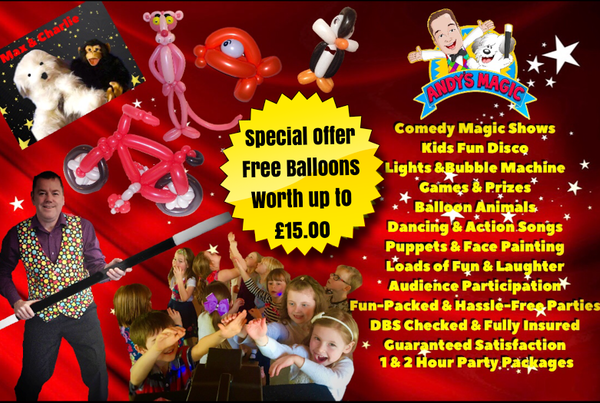 Andy has over 25 years of experience and has performed at 1000' of parties entertaining children of all ages across the Midlands and Solihull and his children's entertainment packages are 2nd to none. A great comedy magic show, loads of laughter and gasps of amazement guaranteed. His kids disco is fun-filled ith games, prizes, a bubble machine and great party music. Add in his crazy but adorable puppets - Charlie and Max - Balloon Animals for all the kids at the party and even Face Painting with Karla and you get a great value for money, complete children's entertainment package, for your party in Solihull, that will make every party stress-free and leave your guests with great magic memories too.